This recipe is so quick and easy to make. Assemble your sheet pan meal while the oven is preheating. Your meal will be done in 8-10 minutes from when you put it in the oven. Now that is fast, easy and nutritious. This maybe one of my go to meals when I need something ready super fast. 24 oz. shrimp, peeled, deveined. Preheat oven to 425 degrees. Line sheet pan with aluminum foil or parchment paper. 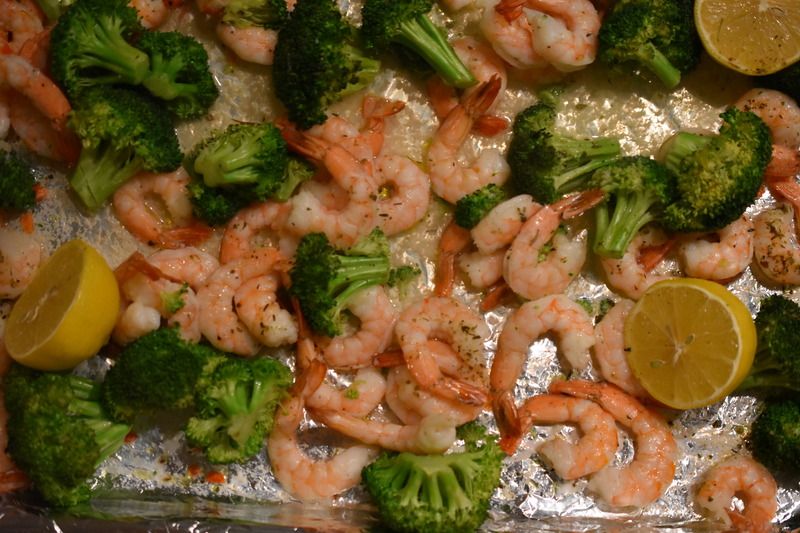 Scatter shrimp broccoli and lemons onto sheet pan. Drizzle olive oil on shrimp, broccoli and lemons. Generously season with all-purpose seasoning. Roast in oven for 8-1o minutes depending on your oven. Remove from oven Serve. Eat. Enjoy. This is the last of the Smokey Southwestern Pork Tenderloin and Roasted Carrots and Cauliflower. The carrots and cauliflower is what I will be using today. Because I used my All-purpose Seasoning on the vegetables I have a little more versatility for this next dish. You will never know this was first made to go with something that had a Smokey Southwestern flavor profile. The vegetables are completely transformed into a sating Shrimp Chowder. Over medium heat add avocado oil, onion, celery, apples, garlic and ginger to a large dutch oven. Season with sea salt. Cook until veggies or translucent and softened. Add cauliflower and carrots. Stir until well combined. Add lime zest and juice; stir. Add chicken broth to deglaze the pan, scraping all the bits on the bottom of the pan. Add coconut cream, stirring until well combined. Meanwhile, as the chowder is cooking chop shrimp in halves or thirds. By doing this you will have shrimp in every bite. Over medium heat add shrimp to an avocado oiled cast iron skillet. Make sure the skillet is hot before adding shrimp. Cooking the shrimp will only 2-3 minutes. You do not want to over cook the shrimp. They will finish in the chowder. Add cooked shrimp to chowder. Stir until well combined. Garnish with a lime wedge to squeeze into chowder. Serve. Eat. Enjoy. This is a fast salad to put together, and husband approved. I know it is a real winner when my honey says, “You can make this again.” It has simple ingredients, however, when you combine them they become sublime. I almost always have these ingredients on hand to make something fast and tasty. 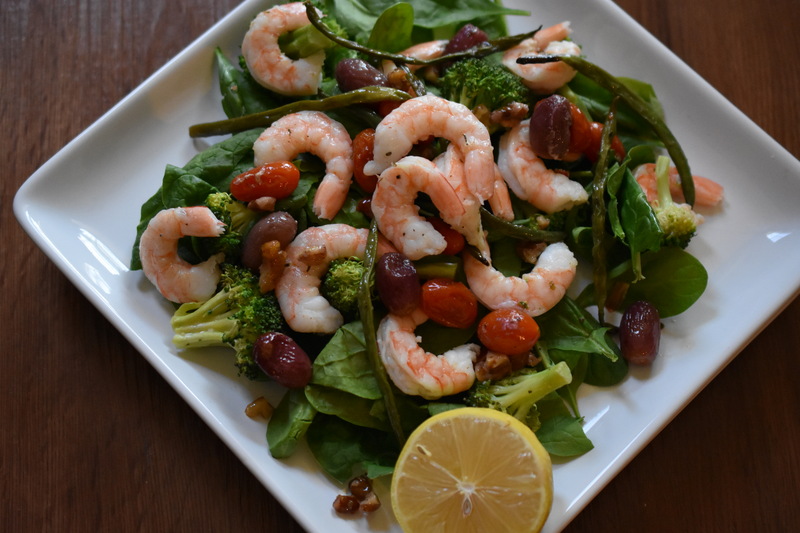 In a bowl combine shrimp, sprinkling of smokey southwestern seasoning,1 tbsp of gremalata with a twist and a drizzle of olive oil. Stir to coat shrimp. Set aside. in a mason jar add juice of lime, pinch of sea salt and pepper, and olive oil. Shake well. In a large skillet melt coconut oil over medium heat. Add peppers and seasoning. Cook peppers until almost tender. Add shrimp cook about 2 minutes, turn shrimp. Turn off heat and cover skillet. This will let the shrimp continue to cook, but not over cook them. 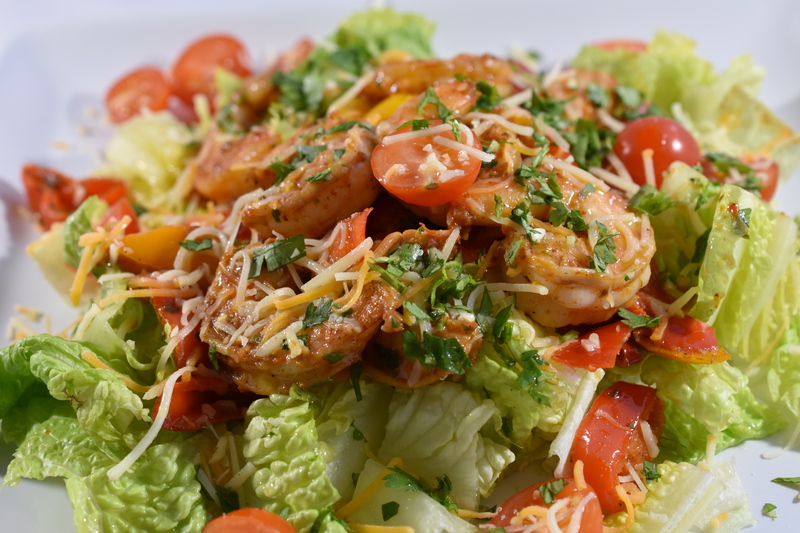 Layer: Lettuce, Shrimp and pepper mixture, Tomatoes, Lime Dressing, Cheese (optional), and Gremalata with a Twist. I have mentioned before that I like seafood and salmon is one of my favorites. It is hard not to like seafood when you live in Florida. There is so much seafood to enjoy. I made this for a quick lunch. The salmon literally took minutes to prepare. Prepare Thai Dressing if you do not have any on hand. Prepare plates with a bed of lettuce. Pat dry salmon filets with paper towels. Season both sides of filet with salt and pepper. Melt coconut oil over medium-high heat in large skillet. Place show side (the side that you want to look at when it is on your plate) down. Leave salmon filet alone and let it get a pretty seared color. This will only take 3-5 minutes. Turnover filet and only cook it for a bout 1 minute. That is all it takes to have a perfectly cooked salmon filet. Place cooked salmon filet on top of greens. Scatter tomatoes on greens. Sprinkle cilantro and toasted almonds on top of salad. I like to put the dressing on the side. It lets you control the amount you want to use on your salad. Serve. Eat. Enjoy. I’ve made this a couple of times now, and I seem to change it a little bit every time. Each time is as good as the time before, even if it’s a little different. This has such a fresh taste. The ginger and cilantro smell so good , and it makes a wonderful change to the plain cauli-rice. On a baking sheet mix the green beans with the olive oil, sea salt and pepper. Place in the oven for about 15 minutes, stirring halfway through until slightly charred and crispy. In a medium bowl marinate the shrimp, coconut aminos, half the garlic, and half the ginger. In a large pan heat some olive oil over high heat. Add the shrimp and marinade and cook 2-3 minutes, until shrimp is opaque. Remove from pan and set aside. In the same pan, turn down the heat to medium; add the sesame oil, the remaining garlic and ginger. Cook about 30-60 seconds, until fragrant. Add the cauli-rice. Cook the cauli-rice about 3-5 minutes, just until the cauli-rice is tender, not mushy. It should resemble the look of fried rice. Add the chives, and half the cilantro. It’s time to plate. Layer cauli-rice, green beans, and then shrimp. Garnish with sesame seeds, cilantro, and a squeeze of lime. Serve. Eat. Enjoy. I really like seafood, and every once in a while I’ll splurge on swordfish. Swordfish is a meaty steak-like fish. It can hold up to a lot of different sauces, however, sometimes it’s just as good without any adornment. This is simple and tasty. Melt bacon fat in a medium sized skillet over medium heat. Pat swordfish dry with a paper towel. Season with salt and pepper. Cook swordfish until golden, and fish lifts up easily. If the fish seems stuck, it’s not ready to turnover. Cook each side until it is golden. In between turning the fish, place a lid over the skillet and let cook. When fish is golden on each side remove from skillet and let it rest. Squeeze lemon over swordfish. Serve.Eat. Enjoy.